Melania Trump was upstaged by a K-pop star recently. On Tuesday, while on tour in South Korea, US First Lady Melania Trump was upstaged by a Korean pop star in the most hilariously awkward way. Two teenage girls, while talking to Melania, suddenly spotted K-pop star Minho standing next to her and, in the words of the Internet, 'completely lost it'. 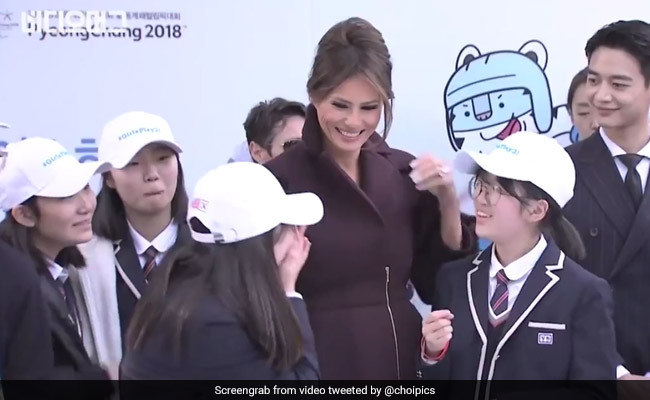 A video that went viral on Twitter shows a schoolgirl, while talking to Melania Trump, realising that she was standing next to a member of the South Korean boy-band SHINee and going breathless with excitement. Her excitement soon spreads to other teens around Melania, all of whom start jumping in excitement. Even Melania Trump seemed really amused by the teen's reaction, smiling broadly at her excitement. According to ABC News, Melania Trump had been nicknamed "robotic Melania" by South Korean media for her stoic demeanor, but many articles praised her 'smile diplomacy' after her meeting with Minho.